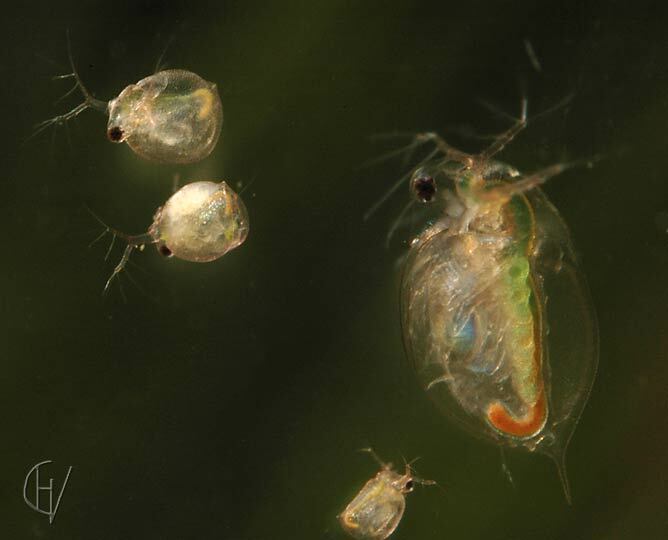 This water flea is together with Daphnia pulex and Daphnia magna one of the most common and largest water fleas, these species have been given their misleading name by there hopping movements. The movement is hopping because the Daphnids are sinking slowly to the bottom, and then move up by beating their antenna, which are transformed in musculous swinging legs, through the water. In normal state they swim head up and are making hopping movements, but research has proved that they can make much complexer movements, sometimes synchronized with a flock of other individuals. If they are in a tank and you place a lamp alongside it, you can see them swimming, horizontally (back's up) to the light. The term longispina describes the long tail spike of the shell. This spike is often much longer in the summer individuals, that could make the water flea more difficult to eat for fishes, but this is doubtful. There are numerous varieties of Daphnia longispina, each small water may have it's own. Like all water fleas the leaf like legs power a constant flow of water and food particles through the shell from which they filter out the edible part, green algae for example (see the green colour of the intestine). The two smaller water fleas top left are probably Ceriodaphnia species, possibly quadrangula.